Housed in a heritage property, Hotel Gorakh Haveli offers air-conditioned rooms with traditional Haveli interiors. Just 2 km from Ghadisar Lake, this property offers a rooftop restaurant and free parking. 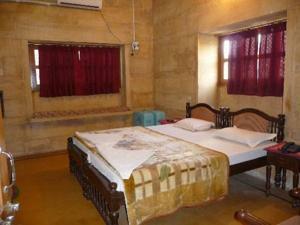 Gorakh Haveli Hotel is situated opposite Jaisalmer Fort, and is a 10-minute drive from the Haveli Sandstone Mansions. Jaisalmer Train Station is 1.5 km away. Rooms come with wooden furnishings with intricate carvings. Each is equipped with a flat-screen TV, work desk and private bathroom with a shower. Free toiletries are also provided. Overlooking Jaisalmer City, the restaurant serves a variety of local and international dishes. In-room dining options are possible with room service. With a 24-hour front desk, the hotel offers luggage storage facilities and safety deposit boxes. Ticketing and travel arrangements can be made at the on-site tour desk. Free! All children under 5 years stay free of charge when using existing beds. One older child or adult is charged INR 500 per night and person in an extra bed. Maximum capacity of extra beds in a room is 1. There is no capacity for cots in the room. Supplements will not be calculated automatically in the total costs and have to be paid separately in the hotel.